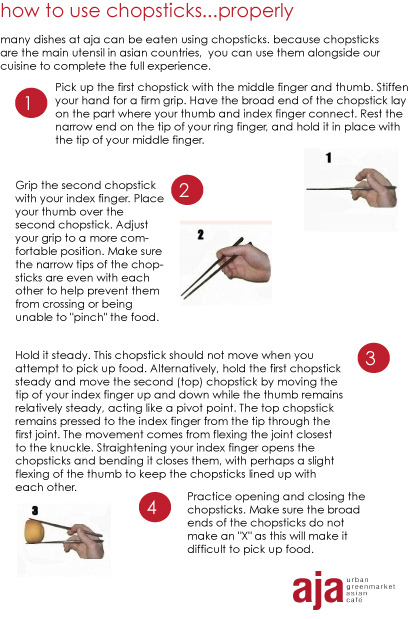 As someone who interacts with guests on a regular basis, I find that many of them have trouble using or are incorrectly holding their chopsticks. To make your life easier, and your stomach fuller, I'm here to show you how to correctly hold and maneuver those seemingly difficult sticks. I was 16 years old. I was completely infatuated with the concept of becoming a chef and devoting my life to good eating. The year I spent living in Helsinki, Finland provided an amazing backdrop to taste, eat, and explore my developing palate in ways I would have never imagined possible. Due to the cold climate and shortened growing season, the emphasis and value of fresh, local ingredients is ingrained in the Scandinavian way of life, and in many ways contrasts the extended growing seasons found in more temperate climates. The mild Finnish summers become celebrations of the vibrant flavors the Finns have craved for the infinite months of winter. In the open-air market that sits at the shore of the Baltic Sea, the aroma of roasting sweet corn, fresh dill, and warm rye bread and pastries fills the air. From the aged wooden boats of Swedish and Finnish fisherman, I encountered the most amazing seafood plucked, in all of its frigid beauty, from the waters of the Baltic, mere inches from where I would sit with my family eating lunch and spending the day. Although I was well aware of the path my career would take years prior to experiencing food and culture beyond the continental American borders, I was now set and certain in my devotion to a lifetime in the kitchen. Since the time I spent in northern Europe, I have slowly gained experience and increased awareness of my craft. My introduction to a foreign culture opened my acceptance and awareness for food as part of our ethnic and cultural identity but also an extension of our personalities, life experiences, and beliefs. Traveling and exposure to new tastes and flavors is an integral part of what makes my job interesting. As an appreciator of all things delicious, one of the most amazing things about food, on an international scale, is to see the same ingredients being prepared so differently in their various growing regions around the planet. This acts as an amazing commonality between people and ethnicities but also reveals the differences in belief and technique that set apart the cooking from one culture to another. The grassy herbal qualities of fresh dill I used to love with smoke-roasted Ivory Salmon in our home in Helsinki is interestingly reminiscent of the dill, turmeric, and fish sauce paired with traditional fish dishes in Vietnamese culture. In the essence of this simple example of parallel ingredients separated by vast cultural differences, lies a relationship that is the foundation for the creative process I have built my career upon. Through the early stages of our childhood, experiences form and give us the ability to relate and respond to the rest of our lives. I was very fortunate to have this exposure at a time when I was desperately looking to form my own opinions about food. It is through this experience, and countless others, I find endless inspiration to translate into all of my cooking. Joshua Linton is executive chef at Aja restaurant in The Dana Hotel in Chicago. He keeps things interesting by combining some of the world’s flavorful cuisines: Janpanese-French, Indian, Middle Eastern and Mexican. Joshua has his own retail line of spices named Ajaspice. Chef Joshua Linton use Aja as a platform for showcasing his passion for Asian eclectic flavors. His exciting dishes are modern and approachable utilizing seasonal, market fresh ingredients and bold flavors...from new twists on sushi to unique “mains”. All dishes are meant to be shared, so everyone can dig into a wonderful array of tastes. The menu is divided into “Begin”; “Noodles and Rice”, “Main”, “Sides” and “Sweet Sticky Things”. The “Snak-Bar” is all about new takes on sushi and “Drink Sake” provides tableside selection of eight carefully selected by-the-glass sake. A small sample of what you’ll find..... “Begin” includes dishes like the Vegetable salad featuring 18 seasonal vegetables, crispy taro and sweet soy-rice wine vinaigrette. “Noodles and Rice” showcases items such as Skinny Noodle, exemplifying the simplicity and seasonality with which Chef Linton cooks: wok-seared short rib with thin, crispy egg vermicelli fresh from Chinatown with young ginger. “Main” entrees include Compart Family Farm Duroc Pork Shoulder, smoked and braised in the traditional, house made Asian five-spice sauce and served in a clay pot with ginger, garlic and seasonal vegetables. Sides, comprised of four items, complement any of the noodle or entree dishes with simple, straightforward flavors like Tofu: dry-aged tofu, wok-fried with garlic chives, house made XO (a spicy seafood sauce aged a minimum of two weeks at aja) and five-spice sauces. “Sweet Sticky Things” offers six, creative desserts, including Bubbles, with shaved ice slushie, vanilla tapioca bubbles and coconut-taro cream. We just added the 'tweet this' option at the bottom of each blog post. Like the article you just read? Share it with your followers on twitter by posting the content on this blog to your twitter account. Since we're on topic, why not follow aja, too. Find us at @ajachicago. Watch Sean as she makes our popular lychee martini, made with .5oz lychee juice, .5oz simple syrup, and 2.0oz of grey goose vodka. lychees are a tropical fruit that contain a nut. grown in countries like china, vietnam, and madagascar, lychees taste a bit like a fusion between a grape and a pear. A classic Irish coffee or hot toddy is hard to beat, but we've fallen hard for this toasty drink at both downstairs aja and rooftop lounge Vertigo inside the Dana Hotel. Rich and creamy hot white chocolate gets a kick from Grand Marnier, amaretto and fresh orange slices. It's served steaming hot in a huge jet-black mug, perfect for wrapping your palms around on a frosty night. Situated in the hip dana hotel and spa, aja features seasonal Asian fusion with a focus on sustainable seafood and local products. Its Restaurant Week dinner offerings includes classics like shrimp-and-pork shu mai (steamed dumplings) with ginger-soy sauce and wok-seared prawns with chile-garlic paste. Dessert offers a choice between the strongly Asian-influenced and the straight-up decadent: a shaved-ice slushie with Taiwanese-style tapioca or housemade dark-chocolate "Oreo" cookie. Find aja's Restaurant Week menu and make reservations here or view the menu below below. Watch arron as he makes the mushroom brown rice in the wok. The mushroom rice is an amazing vegetarian dish that features trumpet mushrooms. black truffle, and tellicherry pepper. If you've had the opportunity to dine at aja then i'm sure your familiar with our popular hamachi guacamole. Made with super fresh yellowtail tuna, avocados, barrel aged soy and sliced taro chips for scooping, it's sure to leave you and your mouth happy. follow the steps below to make the guacamole we serve at aja. Start with fresh avocados, lime juice, high-grade olive oil, tomato, onion, cilantro, and serrano chile. Smash all together in large bowl. Next, add salt and toasted ground cumin to taste. Add small amount of soy and oyster sauce at base of guacamole. Serve with chips, crackers, or fresh vegetables. If you want to add yellowtail tuna, you can find it at these markets in chicago: Isaacson & Stein Fish Co. or Dirk's Fish and Gourmet Shop. Dice into small squares and place on top of guacamole. Garnish with micro-cilantro and jalapeno. Helping in the Wake of the Quake (#ChiHelpsHaiti) is a Chicago effort to raise funds to benefit the refugees of the recent and horrific earthquake in Haiti. Funds will be donated to Chicago's Heartland Alliance, an organization which has established an emergency fund to assist survivors. A Heartland Alliance team will be leaving early next week to participate in on-the-ground assessments and in planning emergency responses with governmental, international and community groups. The organization focuses on three major areas: immediate protection services, short and long term psychosocial services and heath care. Heartland Alliance is endorsed locally by Chicago Community Trust, The American Red Cross and Amnesty International. There are two ways in which #ChiHelpsHaiti is assisting Chicagoans in donating to Haitian relief: a fundraiser will be held on Thursday, January 21st from 6:00 pm to 9:00 pm at English Bar, in Chicago's River North neighborhood; and between January 18th and January 24th, participating restaurants around the Chicago area will enable patrons to add a donation of $1 (or more) to their checks to support the cause. Chicago restaurants provide you with a simple and effective way to make a significant difference at this crucial time. It's quick, it's easy, and it will add up fast. From January 18th to January 24th, the restaurants listed below offer patrons the opportunity to contribute to Haitian relief efforts by adding $1 (or more) to your check. At the end of the week, the total amount donated will be provided to Heartland Alliance's emergency fund to assist survivors of the earthquake in Haiti. For a list of all restaurants, visit www.chihelpshaiti.com. Ask your sever or visit the aja host stand to donate to Haitian relief.